PNB Swipe & Be Rewarded ~ Philippine Freebies, Promos, Contests and MORE! 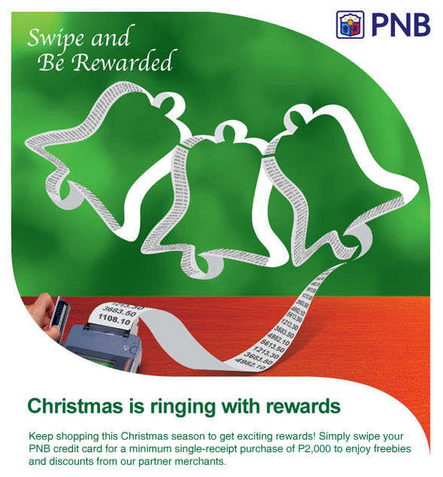 Celebrate this Christmas season with shopping bells ringing with rewards in PNB Swipe & Be Rewarded promo. Keep those cards swiping this holiday season to enjoy freebies/GCs/discounts from Ginza Bairin, Royce', Yoshinoya, SeaOil, Bizu Patisserie, BonChon, Rustan's, The Spa, Barre 3, and Skin. For each single purchase transaction worth P2,000, receive P100 discount/voucher/GC. Spend at least P6,000 and get P300 discount/voucher/GC. Claim P500 discount/voucher/GC whenever you swipe a minimum of P10,000. Lastly, for every P50,000 single-spend, get P2,000 discount applicable only at Rustan's. With so many prizes to choose from, you can enjoy redeeming up to P20,000 worth of freebies.